For those who don’t know, Fats has been in and out of hospital over the last year with issues related to diabetes which has resulted in one of his legs being amputated from below the knee. He is now in a wheelchair and is doing rehab and has a prosthetic leg but is also having issues with his other leg which requires further surgery too. He’s not in a position to work due to his restricted mobility so I thought it was a good idea to put together a fundraising project for Fats which started off as a few tracks, then an EP and has now turned into what is probably the biggest albums in drum & bass featuring 40 tracks to be released as two four-track EPs and two 16-track LPs. Everyone has supplied there tracks for free, I had the whole album mastered for free by Denis Emery, Cygnus Music have done the PR campaign for free and Squake has taken care of the artwork for free too. How did you go about choosing the artists and tracks? That was the simple part. I wanted to keep this as a close thing so I reached out to artists that have worked with Fats before or artists who have a personal connection with him. It’s a family affair! The support and response so far has been amazing and we are only at the beginning of this journey. We set up a SoundCloud page for Fats to post up clips of the album tracks and the amount of traffic going there has been incredible. We’ve had a lot of club and radio support for this project and a lot of online support too. A lot of people have reached out to Fats to show love and support and to offer their help. We thank you all! It’s so hard to go into detail about every track from this project but I can say we have amazing remixes supplied by S.P.Y., Command Strange, DJ Hype & Potential Bad Boy, Makoto, Serum & Bladerunner, dBridge, Cabin Fever, Czekki, Random Movement, Simplification & Translate, Mr Joseph, Total Science, L.A.O.S. and S.I.N. There are also unreleased collaborations with TC, DJ Zinc, Cleveland Watkiss, Bailey, Break & Die, Quadrant, Kid Hops, Iris, John B, XRS, DJ SS, HLZ, DJ Chef, Alix Perez, Squarewave, Will Miles, Eveson, Emery, Semi Sense, Umiko, Mackadena, MC Random, Need For Mirrors, Emtek, DJ Lynx & Terry Tiptoe, Mr Explicit, Basher, Ego Trippin, Brother and Calibre. The first two EPs, We Gotcha Part 1 and Part 2, are already available from all good download stores. 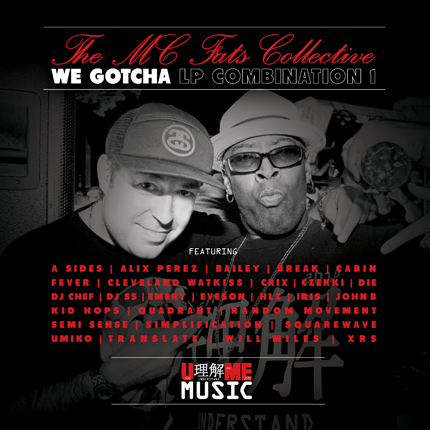 The We Gotcha LP Combination 1 will be released on 19th May and we are looking at 30th June as a release date for We Gotcha LP Combination 2. As of now this is a strictly digital release but we’ve not out ruled doing a vinyl press of some of the tracks from the album.